Late night TV hosts addressed the mass shooting that took place in Las Vegas on Sunday, but arguably none had the raw emotion of Jimmy Kimmel -- whose opening monologue had an extra level of poignancy since the host is from Vegas. "Here we are again in the aftermath of another terrible, inexplicable, shocking and painful tragedy. This time in Las Vegas, which happens to be my hometown," said Kimmel, who was emotionally shaken. 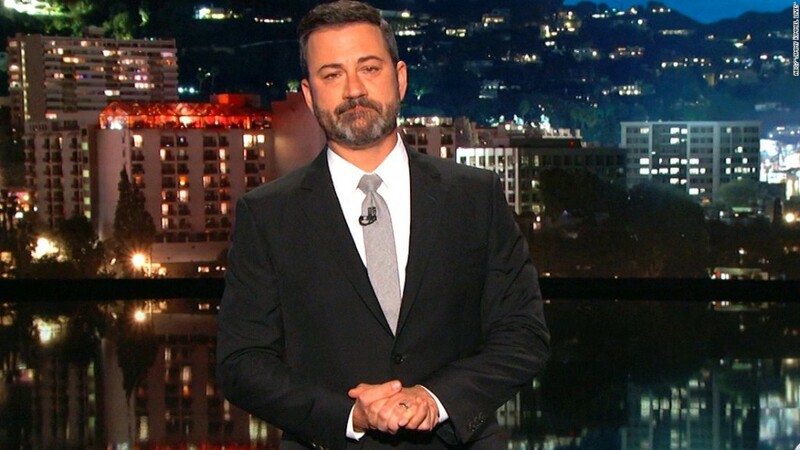 Kimmel spoke for roughly ten minutes at the top of his show about Sunday's shooting, which killed at least 59 people and injured more than 500. It is now billed as the deadliest mass shooting in modern American history. "We have children without parents and fathers without sons, mothers without daughters," he said. "It's the kind of thing that makes you want to throw up or give up." Kimmel then said that he disagrees intensely when people say that there's nothing we can do about gun violence and events like this. "When someone with a beard attacks us, we tap phones, we invoke travel bans, we build walls. We take every possible precaution to make sure it doesn't happen again," Kimmel said. "But when an American buys a gun and kills other Americans then there's nothing we can do about that [because] the second amendment, I guess. Our forefathers wanted us to have AK-47s is the argument, I assume." Kimmel also called out President Trump in his monologue, as well as others like Senate Majority leader Mitch McConnell, Speaker of the House Paul Ryan, and lawmakers who expressed concern in the form of prayers, but, Kimmel implied, had materially failed to prevent the shooting by supporting a bill in February that removed restrictions on gun sales to some mentally ill people. Similar votes seemed likely, he argued, "because the NRA has their balls in a money clip." "They should be praying," Kimmel said. "They should be praying for God to forgive them for letting the gun lobby run this country." Kimmel finished his monologue by telling his audience to contact their Congresspeople to do something, saying that "it's not enough to send your love and prayers." He also apologized for getting emotional. "I'm not great with this kind of thing," Kimmel said. "But I think it's important." The rest of late night also addressed the tragedy in Vegas. CBS' Stephen Colbert opened "The Late Show" in a serious manner addressing his audience and speaking directly to President Trump from his desk. "President Trump, you said you wanted to be a transformative president who doesn't care about the way things have always been done in Washington D.C. This is your chance to prove it," the host said. "I mean this sincerely, you do not owe the Republicans anything. You know the Republicans tried to stop you from being president. Well, screw 'em. You want to make America great again? Do something the last two presidents haven't been able to do. Pass any kind of common sense gun control legislation that the vast majority of Americans want." NBC's Seth Meyers spoke during Monday night's episode of "Late Night" about the tragedy and asked Congress if there are any "steps we can take as a nation to prevent gun violence or is this just how it's going to continue to be?" Trevor Noah, host of Comedy Central's "The Daily Show," who is from South Africa, tried to wrap his mind around another mass shooting in America. "You know what blew my mind this morning? When I realize I've lived in the U.S., in New York for two years now, and in that time there have been twenty mass shootings," he said. He went on to add that he "almost knows how it's going to play out" and that people will ultimately come out and say that now is not the time to talk about guns and gun control. "Sometimes I wish I had used this logic as a kid when I had done something wrong. When my mom wanted to ground me, I should have just said, 'Is this the time, mom, that we politicize what's happening right now?'" Noah joked. "This is a time for us to unite as a family."